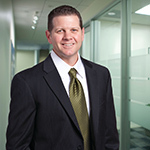 "What we see with younger investors is they aren’t just saving and investing for retirement, which has been the primary focus of previous generations"
SAN FRANCISCO--(BUSINESS WIRE)--New research from Charles Schwab shows that three in five Americans live paycheck to paycheck and that only one in four have a written financial plan, but those who do exhibit positive investing and saving behavior. 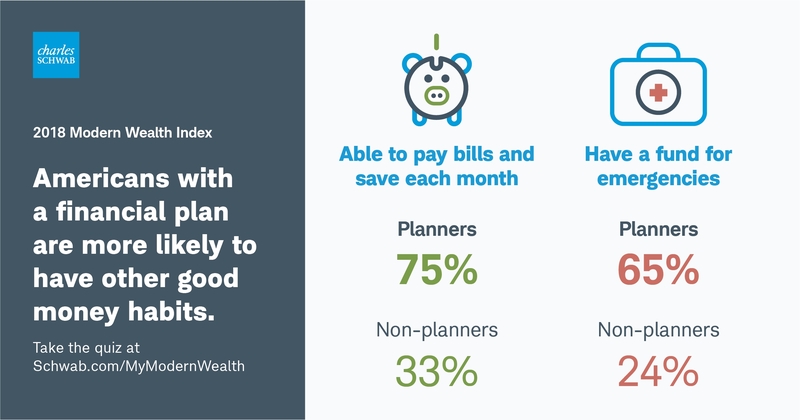 A thousand Americans participated in Schwab’s 2018 Modern Wealth Index, an assessment that scores participants between 1-100 based on how well they manage their money and investments across four factors: 1) goal setting and financial planning, 2) saving and investing, 3) staying on track, and 4) confidence in reaching financial goals. 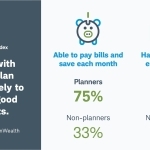 Among those without a written plan, 45 percent say it’s because they don’t think they have enough money to merit a formal plan—the top roadblock according to Schwab’s study. Twenty percent say getting a financial plan simply never occurred to them, and another 20 percent say they wouldn’t know how to go about getting a plan. 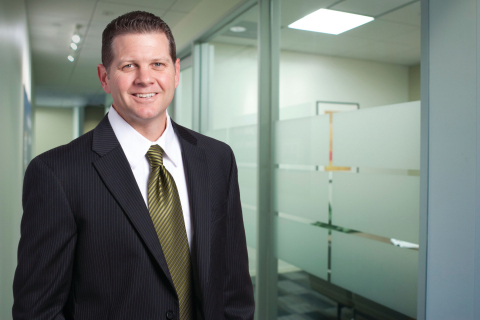 “The idea that financial planning and wealth management are just for millionaires is one of the biggest misconceptions among Americans, and one of the most damaging,” said Joe Vietri, senior vice president and head of Schwab’s retail branch network. 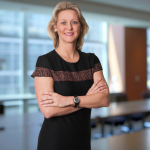 Vietri noted that Schwab held more than 140,000 planning conversations with clients in 2017, a number that has been steadily rising, as have assets in Schwab’s advisory solutions which are growing faster than client assets overall, and are up 18 percent year-over-year to $273 billion as of March 31, 2018. 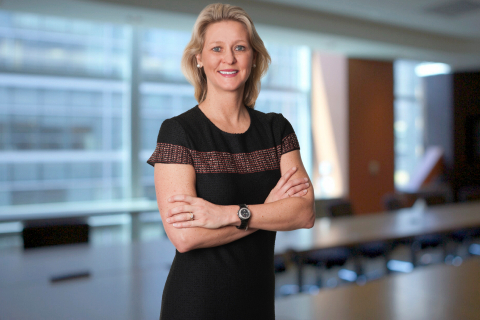 Assets in Schwab’s digital advisory services including Schwab Intelligent Advisory and Schwab Intelligent Portfolios are more than $30 billion, as of March 31, 2018. Other things that make people feel wealthy in their daily lives include owning the latest tech gadgets (27 percent), having a gym membership or personal trainer (17 percent), and using a home cleaning service (12 percent). When asked to focus just on numbers, survey respondents believe it takes $1.4 million to be considered financially comfortable. To be considered truly “wealthy,” that number increases to $2.4 million. 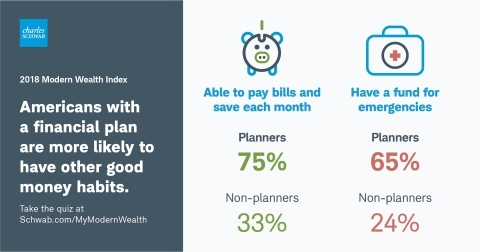 People can take the Modern Wealth Index survey to receive their own personal score in just a few minutes at www.schwab.com/MyModernWealth. The Modern Wealth Index, developed in partnership with Koski Research and the Schwab Center for Financial Research, is based on Schwab’s Investing Principles and composed of over 50 financial behaviors and attitudes. Each behavior or attitude is assigned a varying amount of points depending on its importance, out of a total of 100 possible points. The online survey was conducted by Koski Research from January 12 to January 19, 2018, among 1,000 Americans aged 21 to 75. Quotas were set so that the sample is as demographically representative as possible. The margin of error for the total survey sample is three percentage points.